Euthanasia is basically assisted suicide. There is a heated debate on the morality of euthanasia. Euthanasia is a Greek word which literally means “good death.” In today’s context, euthanasia refers to assisted suicide, or rather specifically to the assisted suicide of terminally ill patients. According to proponents of euthanasia, a person has the right to choose a merciful death, which is why euthanasia is often referred to as mercy killing. They claim that in cases where a person knows that they are not going to live long, or that they are going to be in a lot of pain for the rest of their lives, then they have the right to end their life or have the help of a doctor to end their life for them in cases that they cannot do so themselves. There are three main types of euthanasia: voluntary euthanasia, non-voluntary euthanasia, or involuntary euthanasia. Voluntary euthanasia is when the person who is ill or in pain asks to be euthanized. Non-voluntary euthanasia is when the person is not in a state to give approval, such as when the person is in a persistent vegetative state, or in the case of young children. Involuntary euthanasia is when the euthanasia is carried out against the will of the person or without their knowledge. This is often considered as murder. 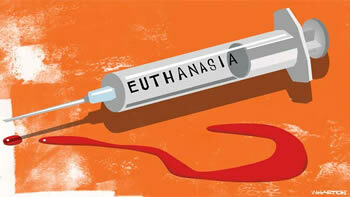 Euthanasia can also be classifies as active euthanasia and passive euthanasia. Active euthanasia is when a person deliberately intervenes to end someone’s life, such as by giving them an overdose. Passive euthanasia, on the other hand, is when a person withholds or withdraws treatment that is necessary to maintain life, such as turning off the machines that are keeping the person alive. Euthanasia raises a lot of questions about morality, especially in the context of religion or social norms. The most primary concerns are that life is sacred, suicide is wrong, and most importantly the question, they want to take their life now, but what if it gets better. Allows peaceful death in a medically monitored environment. What if they want to change their mind? There is no going back from death.